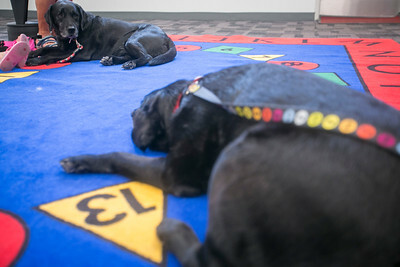 Daryl Quitalig - For Shaw Media Jane Miller, of Crystal Lake, watches Patrick Weiskopf, 6, of McHenry, read to an inattentive Kalani, an American black Labrador Retriever, at Read "Fur" Fun at the McHenry Public Library on Saturday, July 2, 2016. The program was for children who are starting to read, are reading and would like to practice reading, or want to be comfortable reading out loud. Children could read to a licensed therapy dog or simply just cuddle with a dog. The program also gives mentors the opportunity to interact with children as well. Read "Fur" Fun has been running for 8 years. 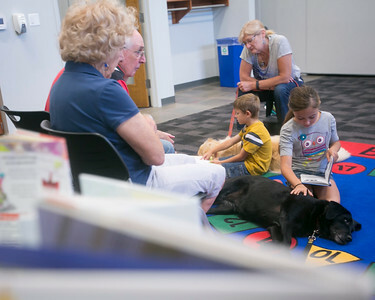 Daryl Quitalig - For Shaw Media Sarah Blidy, 9, of McHenry, pets as she reads to Mattie, a 7-year-old English black Labrador Retriever, with owners Bill and Wanda Broderick listening on at Read "Fur" Fun at the McHenry Public Library on Saturday, July 2, 2016. The program was for children who are starting to read, are reading and would like to practice reading, or want to be comfortable reading out loud. Children could read to a licensed therapy dog or simply just cuddle with a dog. The program also gives mentors the opportunity to interact with children as well. Read "Fur" Fun has been running for 8 years. 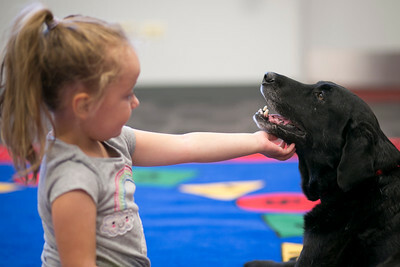 Daryl Quitalig - For Shaw Media Delilah Unger, 4, of McHenry, pets Mattie, a 7-year-old English black Labrador Retriever at Read "Fur" Fun at the McHenry Public Library on Saturday, July 2, 2016. The program was for children who are starting to read, are reading and would like to practice reading, or want to be comfortable reading out loud. Children could read to a licensed therapy dog or simply just cuddle with a dog. The program also gives mentors the opportunity to interact with children as well. Read "Fur" Fun has been running for 8 years. Daryl Quitalig - For Shaw Media Rachel Weiskopf, 6, of McHenry, brushes her hair away from her face while reading at Read "Fur" Fun at the McHenry Public Library on Saturday, July 2, 2016. The program was for children who are starting to read, are reading and would like to practice reading, or want to be comfortable reading out loud. Children could read to a licensed therapy dog or simply just cuddle with a dog. The program also gives mentors the opportunity to interact with children as well. Read "Fur" Fun has been running for 8 years. Daryl Quitalig - For Shaw Media Peter Blidy, 6, of McHenry, pets as he reads to Payton, a 2-year-old light Golden Retriever, at Read "Fur" Fun at the McHenry Public Library on Saturday, July 2, 2016. The program was for children who are starting to read, are reading and would like to practice reading, or want to be comfortable reading out loud. Children could read to a licensed therapy dog or simply just cuddle with a dog. The program also gives mentors the opportunity to interact with children as well. Read "Fur" Fun has been running for 8 years. Daryl Quitalig - For Shaw Media Kalani, an American black Labrador Retriever, looks at Mattie, a 7-year-old English black Labrador Retriever, while being read to at Read "Fur" Fun at the McHenry Public Library on Saturday, July 2, 2016. The program was for children who are starting to read, are reading and would like to practice reading, or want to be comfortable reading out loud. Children could read to a licensed therapy dog or simply just cuddle with a dog. The program also gives mentors the opportunity to interact with children as well. Read "Fur" Fun has been running for 8 years. 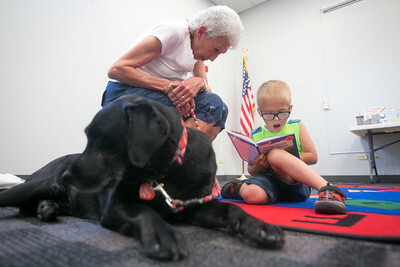 Jane Miller, of Crystal Lake, watches Patrick Weiskopf, 6, of McHenry, read to an inattentive Kalani, an American black Labrador Retriever, at Read "Fur" Fun at the McHenry Public Library on Saturday, July 2, 2016. 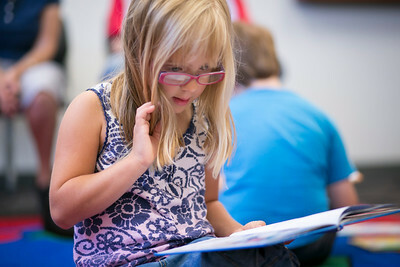 The program was for children who are starting to read, are reading and would like to practice reading, or want to be comfortable reading out loud. 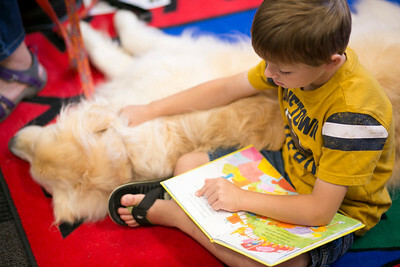 Children could read to a licensed therapy dog or simply just cuddle with a dog. The program also gives mentors the opportunity to interact with children as well. Read "Fur" Fun has been running for 8 years.